Evidence-based medicine (EBM) is a formal discipline intended to sort out what doctors really know from what they simply believe, “to differentiate objective data from opinion,” explained forensic pathologist Dr. John Plunkett at the second Evidence Based Medicine and Social Investigation conference earlier this month. “Evidence should always trump opinion,” he noted. As detailed below, the EBM movement relies more on scientifically controlled research—and less on expert opinion and case studies—than the approach that’s traditionally dominated the medical literature. The arena itself constrains researchers’ ability to study infant head trauma, Plunkett said, and so the results are not reliable, with the exception of “the biomechanical studies that have been repeated over and over with the same results”—that is, that shaking without impact should not cause subdural hematoma. A number of test-dummy videos shown during the conference illustrated his point: When a dummy’s head hit the floor, it would bounce back up, in an arc constrained by the neck, finally hitting the floor again at least once. 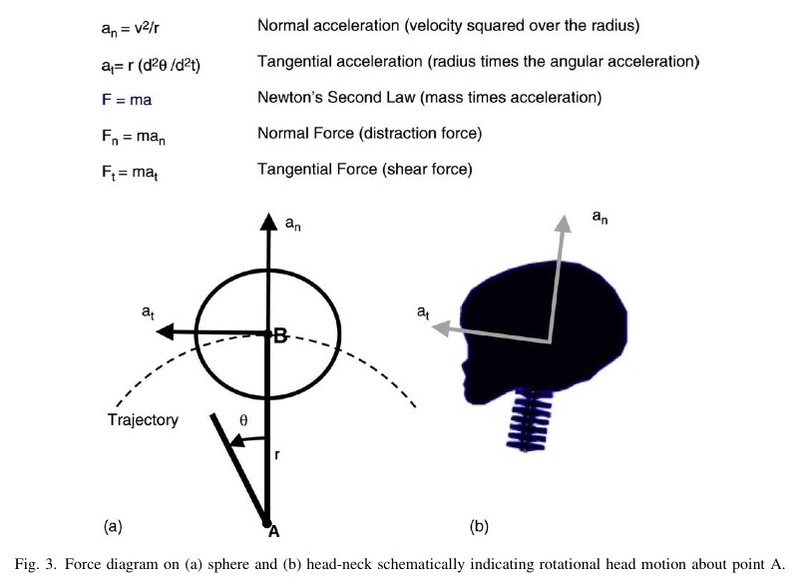 Biomechanical engineers use the term “impulse loading” to describe the rotational forces caused by the head’s motion at the end of its tether, that is, the neck, which is attached to the trunk. “Everything caused by impulse loading can be caused by impact,” Plunkett declared. “The reverse in not true.” While impact can cause subdural hematoma, retinal hemorrhage, and encephalopathy, for example, shaking cannot cause skull fracture. There is simply no need to presume shaking, he said, when a child with the triad shows evidence of an impact. He dismissed ruptured bridging veins as the source of small subdural hematomas, the “thin film” hematomas often associated with a shaking diagnosis. “Bridging veins are large-caliber conduits,” he said, carrying 5 to 10 ml. of blood per minute. “If one of these things is ruptured, you’re going to get a lot of bleeding, and you’re going to get it really fast.” He described stretch tests in which researchers were able to suspend 4 ounces—the equivalent of a stick of butter, which represents about 500 pounds per square inch—from a harvested bridging vein without snapping it. The bulk of the child abuse literature is at Level III on this scale. For an evidence-based analysis of the medical literature about shaken baby syndrome, please see this journal article by Dr. Mark Donohoe. Thank you, I am in constant prayer as Dr Plunkett is the medical expert on my sons current case. It’s devastating to our family, we thank god for your expertise in this emotional and critical area that has not been fully disclosed. God bless you. I am just stunned at the amount of people who are so horribly effected by this diagnosis. I am currently researching and fighting for my son who is accused of SBS and his attorney doesn’t even have the slightest bit of knowledge in this area. I have been reading story after story of people’s lives being ripped apart and the medical system making judgements (mandatory reporters in the medical field) instead of really trying to find out what happened to the child. Isn’t it ultimately about the overall health and well being of the child? Nope! I’m convinced our situation is a medical one and need all the support and help I can get. I welcome anyone who has the heart to reach out and help us fight. I contacted the Innocence Project of Florida and no answer yet. You’re right, finding out what really caused the child’s problems is paramount. Make sure you get copies of all medical records: Pre-natal, birth, and well-baby, as well as the records surrounding whatever event led to the diagnosis. Original copies of all imaging, as well as the reports. Best wishes to you and your son, and to the child. It’s one of the unnecessary tragedies in these misdiagnoses of abuse by shaking, that sick children do not get the care they need. Alonzo send me the Hospital Recors and Lab reports and your account of the events and I wil take ot from there. I will send you and Dr. Innes both an email. Many good wishes. i am not sure where to start…but thank you!!! All of this information has been very helpful to my family and i. My sister is fighting a case with sbs right now and this information helped alot…. Thank you for posting, Jessica. Best wishes to you and your family—please tell your sister there is a community who understands her plight. If you haven’t found the Resources page, check it out. I am so sorry to hear that there are more people accused for SBS…The only thing I can tell you is to be strong mentally as well as psychologically. Do something productive to your life while waiting for the seemingly endless legal process. Please do not dwell on what the prosecutor said and what really happened – you’d drive yourself crazy if you do so. Stay healthy, strong and enthusiastic – you have to regardless of the result!!! This is what I did when I was in the system and had been falsely accused for the same. I wish your sister and your family the best!!! If you send me details including all Hospital and Lab reports I will be happy to provide a report pro-bono. “Please do not dwell on what the prosecutor said and what really happened.” Seriously good advice. The two are irreconcilable. what happens when there is no triad ever found and you are still accused of shaking your child. This happened to me. We had brought our son in to the hospital and after a CT scan were sent home. He went in with a very enlarged head but we were told that it was an excess amount of CSF and that it should absorb on it’s own. A little better than 2 weeks later we were back in the hospital for a routine follow up and MRI scan and they found bleeding. They instantly made the accusation of SBS and we were told that he would have to undergo immediate surgery to remove the hematomas. After the surgery they completed the remaining tests to confirm their thoughts of SBS but there was nothing else. His eyes were clear of damage, he had no bruising and no broken or fractured bones and his brain was actually being compressed as opposed to swelling. I am in the process of getting all medical files including CT scan and MRI films sent to me and am in need of someone to look into this. I am very sorry to hear your story. My suggestion to you is to pray to a higher power, whomever He/She/It is to help you. Good luck! You’re doing the right thing by getting all the medical records, including scans. The pleasure is mine Sue. I’m sure with your help we shall soon have the Diagnosis SBS banned . The”triad” does have an explanation – Vitamin K Deficiency Disease. Thank you, Dr. Innes, for checking in. I have heard of your valuable work, and I’m pleased to make the connection. Dr. Innis me and my husband ann his daughters mother are currently being accused of SBS with his daughter. She was never shaken by any of us, and she was never checked for any vitamin deficiency or any other cause. She had been with an “ear infection” prior to this and during her infection the side of her left ear was swollen. is there anything you can do to help us. We are currently in family court where my 11 children were taken from us because the baby became ill at my home. Bt none of my children have signs of abuse. We return to family court on Oct 4, 2013 n they are trying to press crimianl charges as well. Your attorney needs to get some outside medical opinions immediately. I’ve forwarded your email to Dr. Innis and sent you a separate email. Best wishes. Thanks for working on this…I am speechless! Best wishes, Katie, as always. Thank you, Audrey. I appreciate the validation. 2013 update: Since this exchange, Audrey has published a book about her trial and decade in prison before her conviction was reversed through years of work by the Wisconsin Innocence Project.